This travelogue is built in five posts — an introduction page and four posts covering different regions of the city. Use the links below or the map provided to navigate to the different posts. If there is only one eastern European city you have time to visit — this is the one. Not only because it is one of the most gorgeous and fascinating cities on Earth, but also because it is so convenient — just a few hours drive from Germany. I visited there twice and still feel as though I’ve only scratched the surface. Both times I concentrated on the city center — there’s a lot in the suburbs that I did not visit. But the city center is so gosh-darn big, I piled up enough material to justify a four-chapter series. There are dozens of places to see as you make the long climb up toward the Castle. This is covered in the first chapter — the Malá Strana district. Starting with the famous St. Charles Bridge (second photo), this chapter takes you through the Embassy District, St. Nicholas’ church, and up to the top of the hills to the viewing tower (Petrinska rozheldna) with an excellent view of the city. The second chapter is on the Castle District, known to the locals as Hradčany (h’rahd-CHAHN-ee), shown in the first photo. Prague Castle and the Cathedral inside sit high above the city, and are a must for any visitor. Both are colorful and immense with numerous attractions, and quality eateries. 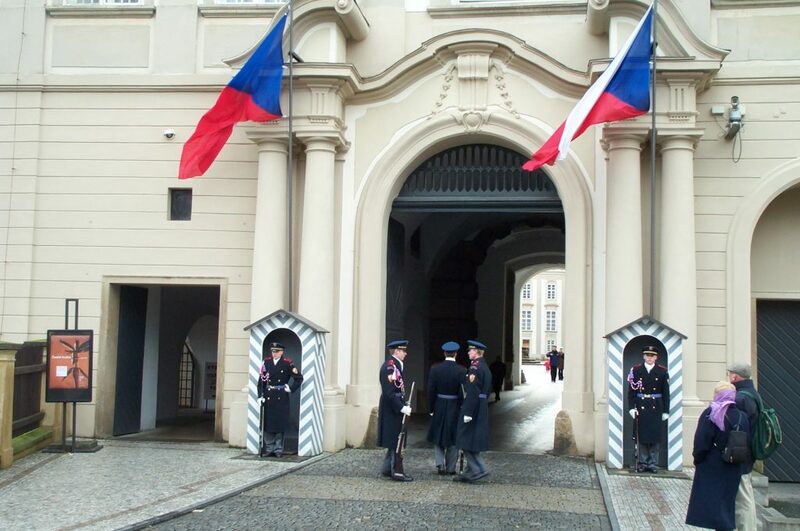 Unquestionably, this Castle is the center of attention in the city and the heart of Czech national pride. This chapter also covers the Lareto convent further back on the hill. The third chapter is the Old city, called the Staré Město. 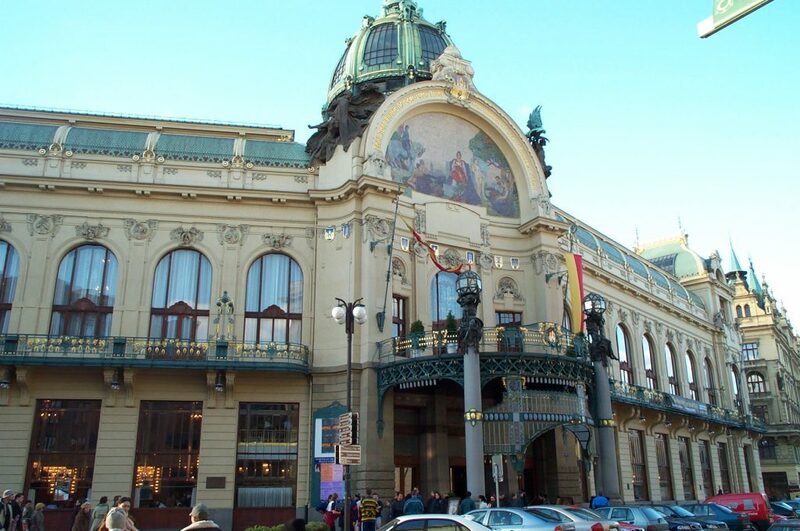 Staré Město has much of Prague’s best architecture, with elaborately-colored buildings, huge market squares, and loads upon loads of souvenir and crystal shopping — Czech being very well known for its crystal. 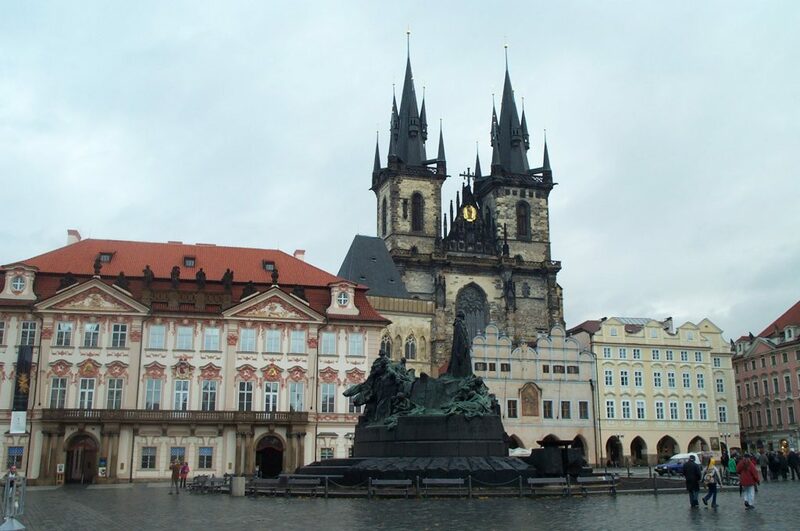 Among the great attractions are Old City Square (the Staromestske nam. ), with the Tyn Church in the background, along with the Old Town Hall (Staromestske radnice), and the National Theater (nadolni divadlo). The final chapter is of the New City, or Nové Město, which is not new by any means. Nové Mesto is where the locals go to shop, and where the tourist kitsch is much lighter. This district virtually surrounds the old city and the east bank of the Vltava River, carrying such cultural attractions as the City Museum (third photo, shown at night), the City Opera House, and the Obecni Dom. 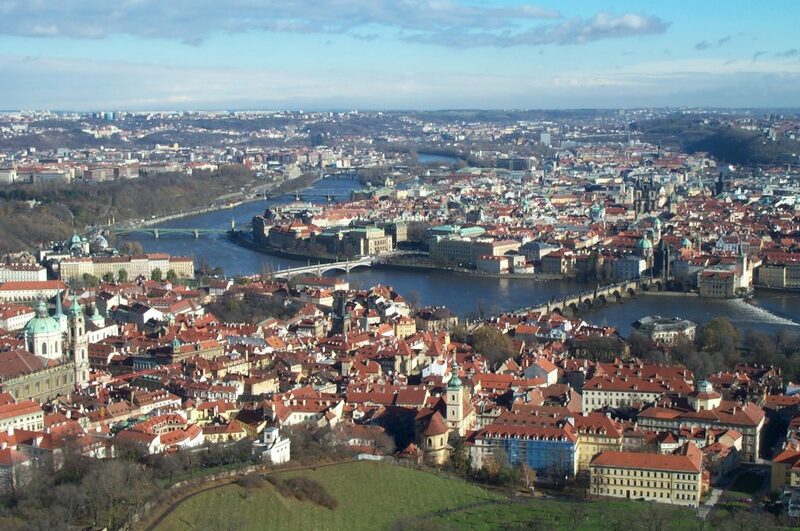 Prague caters very well to tourism. It sports a very robust transportation network with buses, streetcars, and taxis, so getting around is really easy. Pensions and hotels are very common, most providing comfortable and quiet rooms at very low prices. Some pensions can sell day-long bus passes, good for anywhere in the immediate area. Below is a city map of Prague with the regions highlighted corresponding to the four subchapters in this travelogue. The highlighting does not exactly match the geographic layout of the four districts covered (for example, the borders of the New and Old cities are not precise, rather they illustrate the territory covered in the chapters. Click, and enjoy!!! The map is created using a screen capture of Google Maps with the areas added using Adobe Photoshop. Image maps were created using the Free Online Image Map Generator.